As you may know, I am working on my King´s Cruiser 33 refit program since last October now and have made plenty of progress, yet had to experience some setbacks as well. Nevertheless, despite my own steps in refurbishing my sailing yacht it´s always a pleasure to talk to people who have completely finished their refit to participate from their experience, their view on certain details and get an impression of what I´ve maybe still up to encounter in my own struggle to get SY OLIVIA back into the water again. I was especially excited to talk to Nina of SY ZIRKON on their refit-program lately – what an impressive story! As the saying goes, the ship finds its owner, not the other way round. And that is how SY ZIRKON got into the lives of the two: “Hanno´s father called up and said that there was a yacht which could be of interest available in Mallorca. So no 24 hours later Hanno boarded a plane and took a look at her. When he arrived, my phone rang and he said – this is her! – and that´s how we got her. It was love at first sight I guess.” The two were looking for a classic sailing yacht with a beautiful drawing and the Dutch built Frans Maas “Breeon”-Type Sloop was exactly what they were looking for all the time. 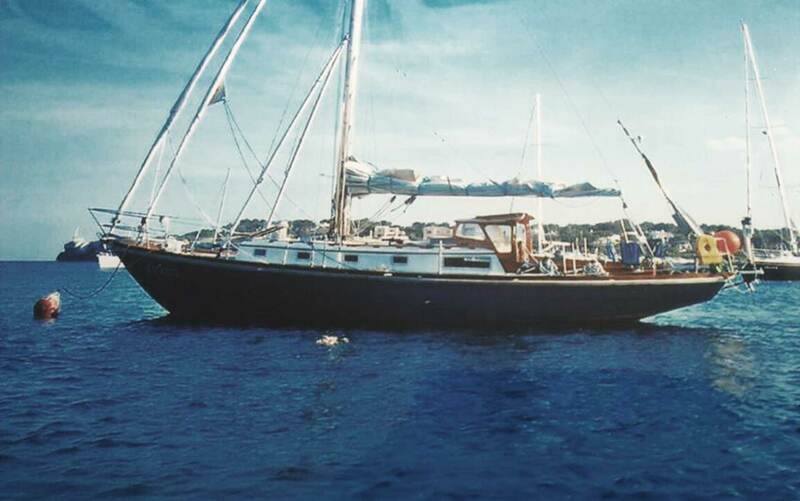 This 37 feet sailing yacht had “a considerable width and was flat at the freeboard, beautifully composed” and as she was built in 1967 as one of the first GRP-yachts ever there was plenty of material: The thick, sturdy hull was built in Amsterdam. “Now or never!, we thought and it took no more than a few days to have the contract of purchase signed and she was ours.” Nina tells the story with such enthusiasm, it´s a pleasure to watch her talking – truly loving her ship and everything connected to it. I have to smile when Nina is answering my question whether it was clear from the beginning, what a refit would mean to the two: “Well, she is an old lady and next year she will turn 50 years. 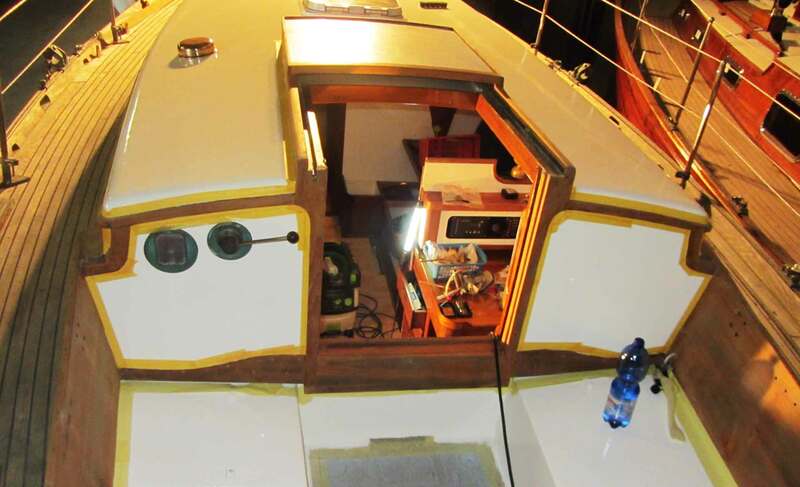 It was absolutely no question if we would have to refurbish her: Yes, of course!” But they didn´t fear the coming, since Hanno has a lot of experience in refitting boats: Father and Hanno did refurbish a Contest 33, after this he went on to work on two follow-up projects and thus knew exactly what to do. A freshly built Navigator´s Place: A Marvel. Of course, starting to work Hanno and Nina tried to have everything prepared properly: With Excel on their Laptop. “We´ve made a list, adding item of item and tried to prioritize them. Later we skipped that method because it was inefficient for us.” She remembers sitting in front of the computer and trying to thing the next steps through, constantly changing the list, which became a thing of a time-eater for them: “It made no sense to us in the end because when we crossed off one item three more appeared. Planning was impossible so the list became obsolete.” I know what she´s talking about – I do plan my own refit with an Excel-Sheet. 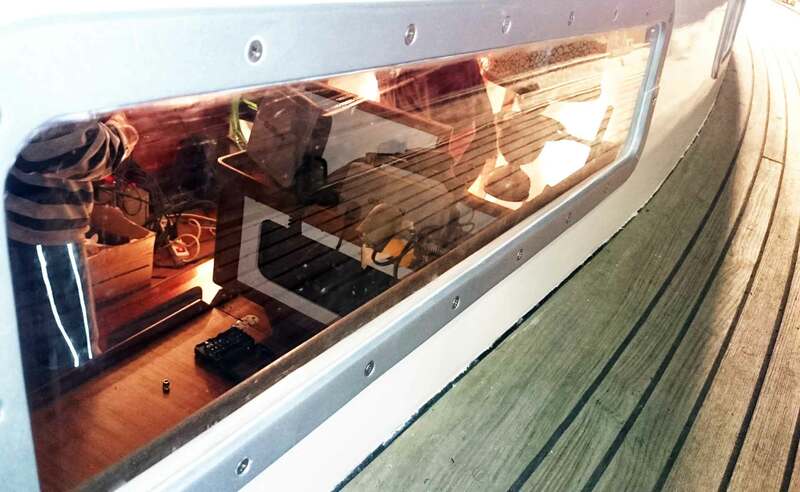 Well, I try to … With Nina and Hanno more and more proceeding their refitting work it was primarily the weather responsible for sudden changes: “As we had our Yacht standing in an outside area for the first weeks we were very dependent on temperatures and precipitation. 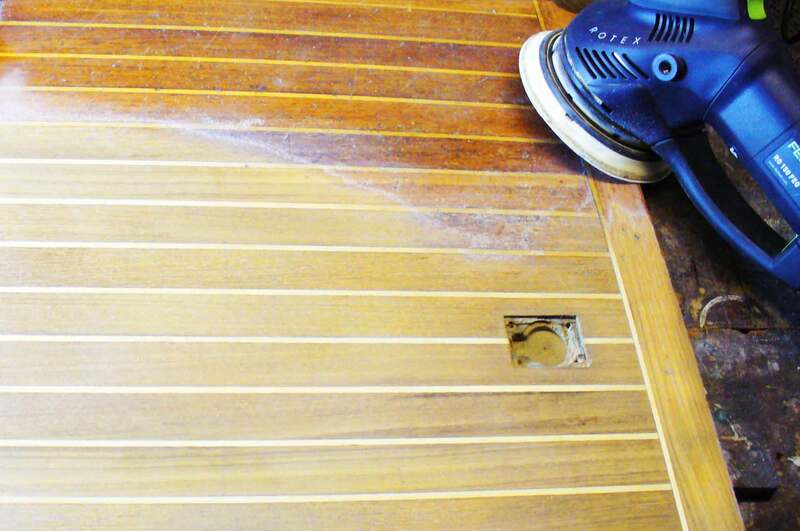 Starting our refit in Winter, heavy snowfalls could postpone a task, demanding fast changes of work. Planning ahead was thus an impossible thing.” But they soon found out that a different kind of written aid was far more effective. 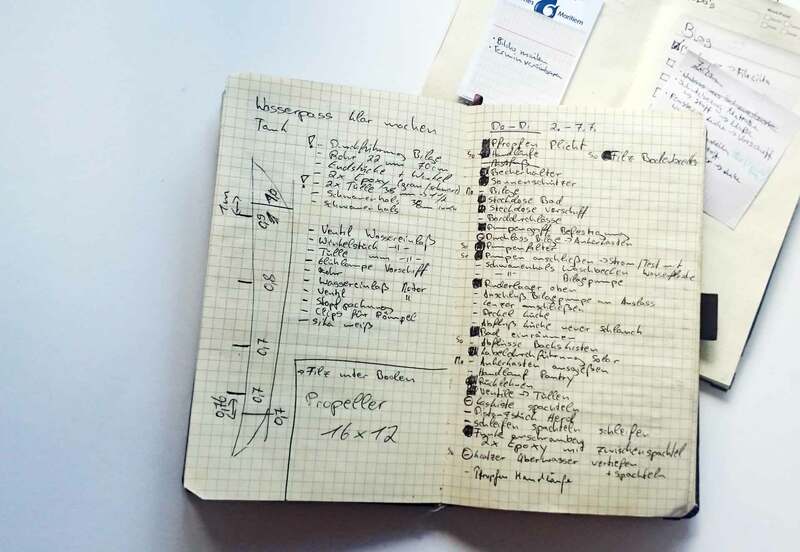 Skipping Excel-sheets for pencil and paper-notebooks: “This is what we call a Boatbook. We do have a handful of them.” Nina shows me a paper made notebook full of handwritten stuff: “What turned out to be very helpful for us have been handwritten to do-lists. Just plain and simple: What steps to be done and when – mostly planned for just one single day or weekend ahead.”, Nina says. “We used to make a list which items to buy when going for another weekend to the boat.” Then they tried to work their ways through the list. 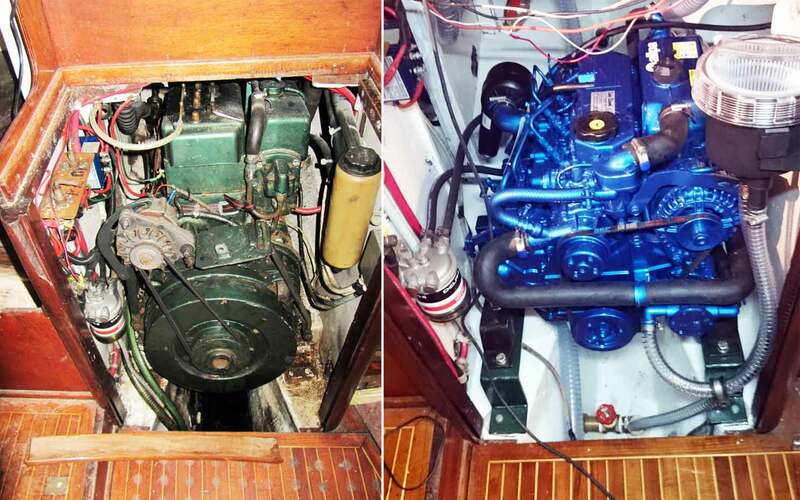 Perfect new Engine in a freshly painted hull/bilge. There was no real paradigm to which they re-designed their boat, Nina confessed. 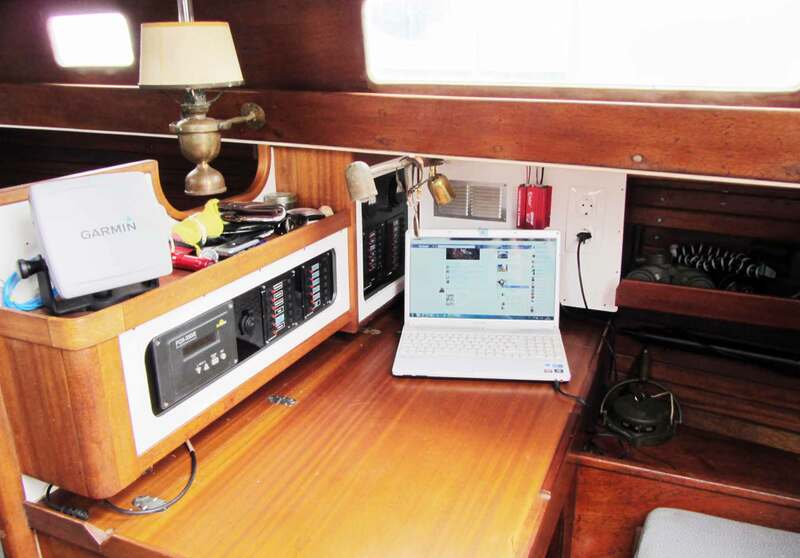 Other than me: I am constantly looking for inspiration (just like on the Hanseboot-fair or inside a Hallberg-Rassy dream yacht) the couple was up to “having our boat styled the way we would feel comfortable with her.”, Nina says. “We wanted to preserve the character of the Breeon-type vessel on the one hand but to add a little more comfort and modernity as well.” But having a TFT-screen was no option at all. 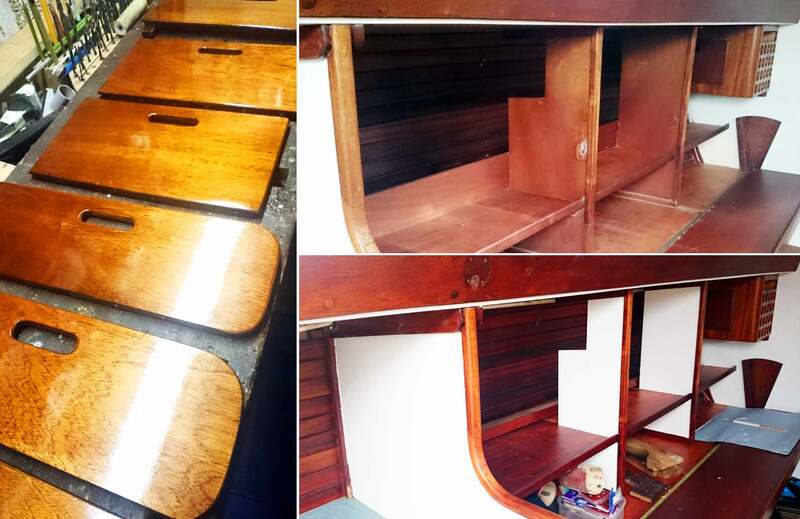 Refurbishing and painting the stowage amidships. I am very interested in how they did structure the refit and which milestones have been accomplished in which order. 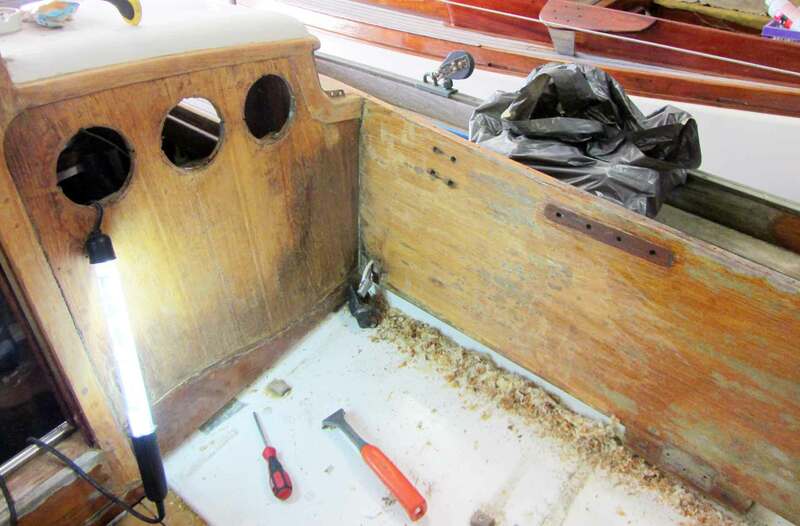 “Well, as I mentioned, we started with the interior refit, just as you are doing due to the fact that we began work in late Autumn and Winter.”, Nina begins: “After emptying the boat we have been sanding and painting all wooden panels, parts and stuff. We did do it at home in Cologne where we had prepared a room in the basement and garage of my parents-in-law with a heater to get a warm and dry atmosphere.” Sitting on the couch and polishing the brass instruments whilst having a good DVD in the player. Then the yacht was brought into a hall where work went on. During that time all of the electrical wiring has been renewed and we had our gas-installation checked by a professional expert.” A lot of time has been invested by ZIRKONs crew into refurbishing the pantry, the part of the whole project of which Nina seems to take most proud in. It was also the help of many friends and their families as well the two are very thankful of: Without an occasional BBQ at the yard with free beer drawing attention of their friends some of the work wouldn´t have been finished. 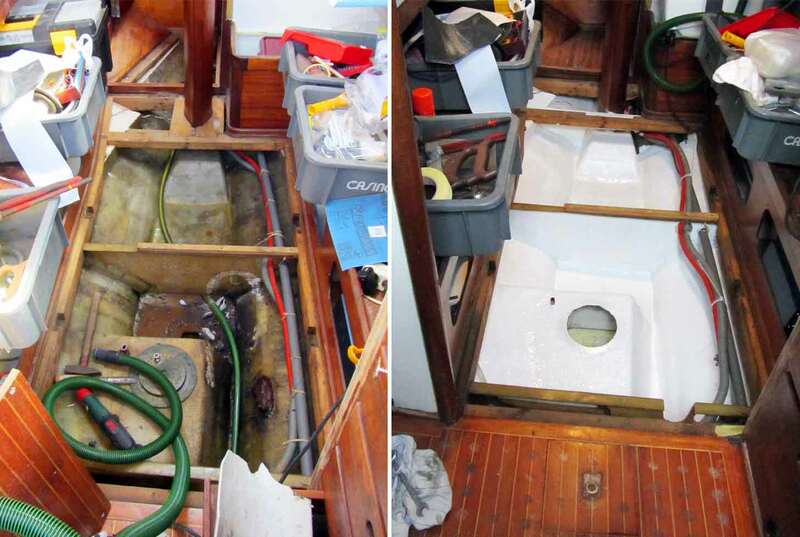 Getting a clean & dry bilge. When I was beginning my work on SY OLIVIA the first step of the whole refit program was to completely empty the boat (here´s an article on that one) Nina has her very own memories to this stage of the refit: “We found tons of old papers, charts and even pictures, which was very interesting: 50 years ship´s life is a rich collection of stories.” For example, ZIRKON had passed through the Suez Canal, a thing rarely done by sailing yachts in our not so peaceful present times, was anchoring off Durban/South Africa and went over the Atlantic several times. “Hanno is not the person who gets involved with memories too much but I was excited to roam through old issues of the 1970ies of the Transocean Magazine.” That was way before the Internet and the hordes of the big charter fleets have been occupying the marinas around the world. 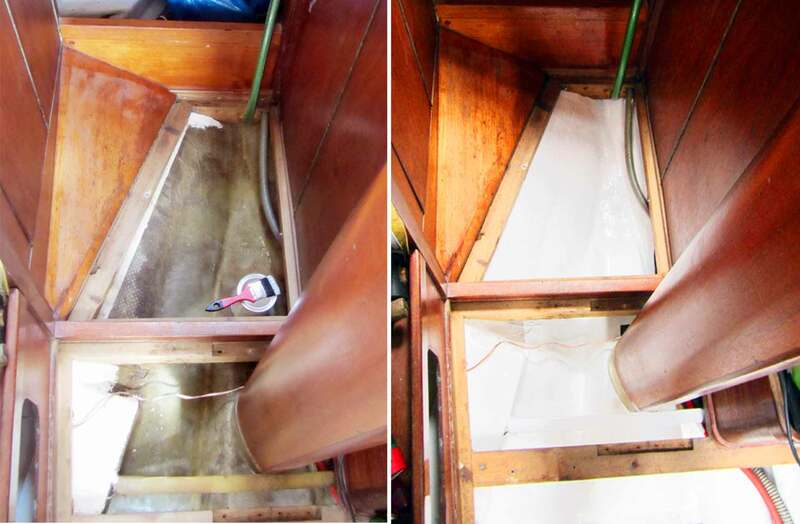 The laminated freshwater-tank and a shiny new bilge. If they did find the 1.000.000 Euros behind a panel? “Oh, indeed, we did find a secret drawer. There has been no money nor bars of gold – but instead very precious spare parts for the engine which we had bought over time expensively which was a bit annoying.” The nicest thing of all, Nina says, was that there was no serious sign of Osmosis at the hull at all and – as the harbor master was reassuring the two, that the fitting of the new engine has been done within under 10 minutes right away. “We were very, very lucky with ZIRKON concerning bad surprises.” Finding just two rotten spots was among them but refurbishing was a no brainer. 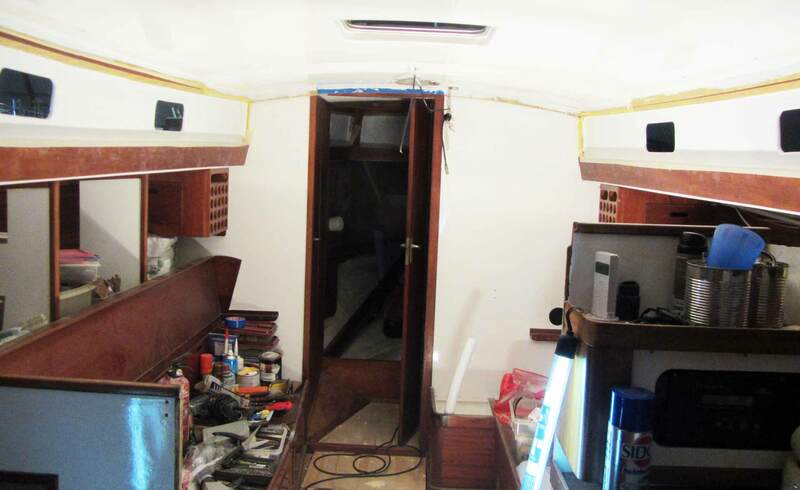 Asking Nina what in her eyes was the hardest part of the refit, she has a clear answer: “Working for a whole of 12 months, sometimes 7 days a week and spending all of our holidays to get dirty in the bilge was the hardest. This resulted in a lot of stressful situations – especially during winter when it was so hard to be motivated to work in temperatures well below zero. This double-loaded burden of working, having no spare-time and working at the boat connected to shuttle between Cologne and the Netherlands was awful indeed.” But, as she puts it: They were determined to go through hell all and at once to have the boat finished as soon as possible. Making decisions was also a concern: “Hanno was sometimes going crazy over the question which paint to use, 1K or 2K, or other material-related questions on which certain things were dependent.” Finally, she says, hard again was to ensure that nothing was forgotten: A huge task given the fact that they didn´t had a written masterplan at all. If there were things they wouldn´t do again if they´d have to restart the project? Old vs. New: The stone-like new pantry. Nina´s love. Safety at work: Breathing masks by 3M are irreplacable! Refit means a lot of hazardous dust and odors and the masks by 3M with active coal filters proved to be so efficient that the two would recommend not to do a single step without them wearing. 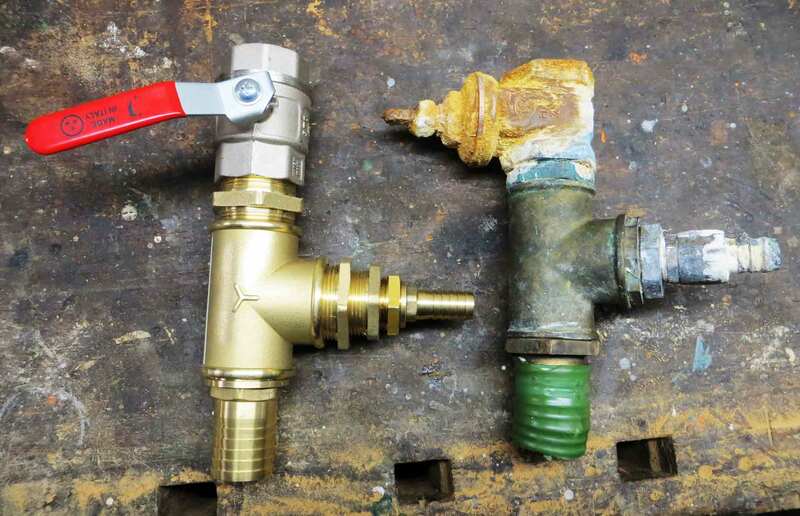 Having the right tools is just the beginning – having good tools is the key to success. As the two are stating, to spare a Buck on tools will result in inferior finishes when it comes to working with them. In the end, cheaply bought is bought twice. The secret hint: Beer & steaks in the fridge is essential. Nobody would follow an invitation like: “Hey, do you want to spend a weekend with freezing cold temperatures cleaning a filthy stinking bilge and getting dirty while breathing diesel-fumes?”. Instead, offering cold beer and a fat steak from the BBQ and “let´s see if we can do something for the yacht” will draw the attention of people. A clear cut plan: When will this project be finished? That´s the key. You have to have a guideline at least, knowing when you will finish the work. Doing a bit here and a bit there will lead to an endless chain of unfinished work. 3 years, 4 years of fiddling around? Forget it! Last but not least: 5, the most important one – a piggybank: Everybody who will let out one of the following hackneyed sayings: “Wow, that´s really a huge project you have here!”, “How much did you pay for this bucket?” or “But it has fine lines …” will have to pay 1 Euro. If you do so, half of the budget needed will be re-financed by the saying-piggybank. That sounds like a handful practical tips to me. Some of those are new, some daily life of my own reft program. In the end I am interested in “what comes next”? Since SY ZIRKON is ready to cast off now, is it the big roundtrip the two are heading towards? What the best thing of their refit was, I ask in the end. “Oh, that’s an easy one: The day we finished work and crossed off the last item from our list, we took the ship out of the hall. It was a late afternoon and the craning was set for tomorrow, so plenty of time. Instead of sleeping in our trailer, we sat down in the cockpit high above the ground. Hanno did prepare a great dinner and we had a glass of wine – next to us the sun was going down and it was just a marvelous thing.” Next day, when the SY ZIRKON was back in the water, the two had the first hot coffee made in the shiny new pantry, she describes it as the most moving moment of the whole refit. The two don´t have any plans right now. 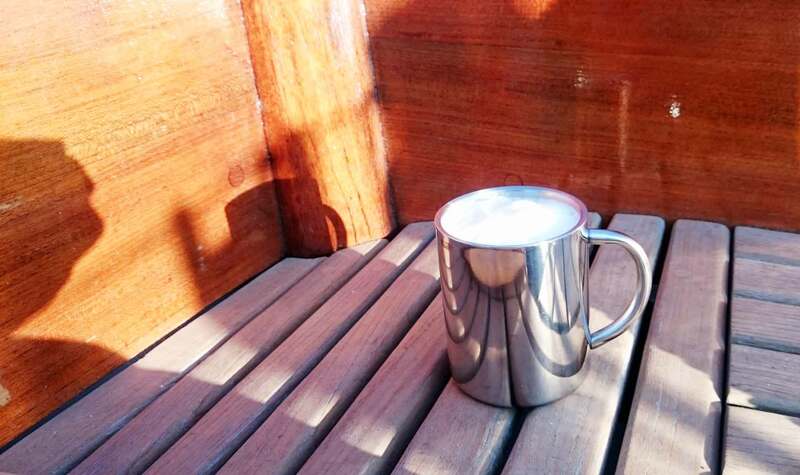 “We want to replenish our financial situation, work hard for some time and safe the money for the big trip.” In the meantime the two want to sail the North Sea and the Baltic, see the Danish coast and get familiar with their new old ship – SY ZIRKON, the 50 year old brand new Breeon-Sloop by Frans Maas. Hanno and Nina like to thank especially Heinz: Without him the whole project wouldn´t have been possible. Peter for being so tireless at working at hard at every single item of the refit-program producing progress and good mood in the team. They both like to thank Manuel and Bruno who have been working their ways through the heaviest, dirtiest and most tiring of all the jobs – demanding nothing more than beer and steaks (and for still being their friends anyway). Thanks to all friends and family-members who are not too bored listening to their never ending tech-talk, who have supported us in the past project and giving us power for the coming. And a big thank to you, Hanno & Nina for having shared your insights and story of refitting a classic sailing yacht with me and my dear reader. You may browse their website to follow the trail of SY ZIRKON.